Title: 'Isle et Royaume de Candie', Paris, 1719, From 'Le Nouveu et Curieux Atlas Geographique et Historique'. 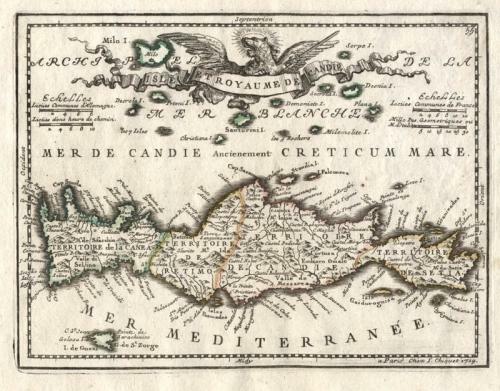 An elegant small map of Crete by Jacques Chiquet. This map is quite rare and is noted for the precision of the engraving but it is also interesting for its retention of an older style of decoration at a time when French cartography was at the vanguard of a more scientific approach. The map is in excellent condition with wide margins.